In January at the Drum Corps International Annual Meeting and Conference Weekend, DCI Executive Director Dan Acheson addressed a group of more than 50 Tour Event Partners (TEP), in what has become known as his annual "State of the Activity" address. Each year, Drum Corps International sanctions more than 115 events as part of its annual summer tour. The TEPs are the network of individuals in each host city who handle the logistics and production of their respective DCI shows. A focus of the keynote address included a look ahead to DCI's commitment to the city of Indianapolis where the organization will hold its World Championships for a period of 10 years in addition to relocating its day-to-day operations and office facilities. Just this week, DCI officially moved from the Chicago suburbs to its new location in downtown Indianapolis. The following is a report from this January session. Focusing on the theme "Excellence is in the Details," Acheson delved into the critical importance of details in the production of everything drum corps-wise. He started by analyzing a performance photograph of the Phantom Regiment taken during the corps' 2007 production when a tight wedge of horn line members kicked out their heels in a stationary pose. While many might just see a photo of a really neat moment, Acheson pointed out the details that went into the uniforms, the hours of instruction and practice that preceded the performance, the fund raising for the corps to get on the field, etc. Each element has several facets that further have several components. When one explores something as simple as a photo of a corps, one can notice an unending number of variables that have to be tended to in order for us to enjoy the spectacular productions fans see on the field. 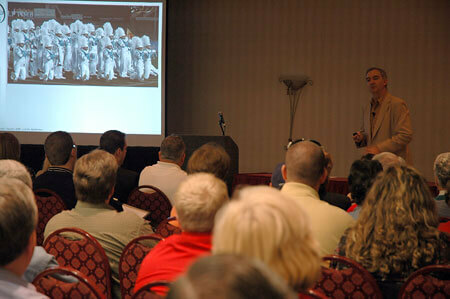 DCI Executive Director Dan Acheson addresses a group of Tour Event Partners. There are many positive developments boding well for DCI's future. The commitment of Indianapolis to the organization promises to develop into an increasingly productive and symbiotic relationship. Attendance at the 2007 DCI World Championship Finals was the largest since 1994, the Friends of DCI program is thriving and with the launch of DCI's new OnQ Performance Education Division, a new series of offerings is starting to come forth from the organization. But there have been some challenges along the way, and Acheson explained how the organization will stay focused on stabilizing operations to respond to the new demands of the marketplace and a changing global economy. Acheson also touched on the new governance structure for the Drum Corps International Board of Directors, explaining the position of the board in the early days of DCI compared to today as a new structure was approved just about an hour before the keynote address. The importance of Indianapolis to the future of Drum Corps International was further explored, with the synergy between the city and DCI — plus the benefits of having DCI's headquarters in the same city of the World Championships — turning out to be an ever-growing entity. Centralizing the World Championships will allow the annual DCI Summer Tour schedule to be setup far in advance of what has generally been expected. This in turn will allow Tour Event Partners to start promoting their events and will let corps work on their tour logistics far earlier than they could in the past. Many new challenges and opportunities are happening at the same time. Depending on the collective attitude, Acheson explained, these can either result in a perfect storm of trials or a great prospect for advancement and growth for the activity. He clearly asserted that in paying close attention to the details and through the results of everyone's concerted efforts, the latter option will prevail.